I collect quotes. Snippets of inspiration jotted down on scraps of paper float around my desk and my study, usually for months, sometimes for years. The really lucky ones get printed and put on my pinup board, (and let’s just say pintrest has been a godsend for me in this regard). This is one of my favourites, and today it is speaking to me more than ever. Why? Because I feel tense, the familiar upper back/neck tension I get when I have been working in the garden (which I have) or picking up the kids too much (yes, they are getting heavier) or just letting things get on top of me (that can’t be right!). I am worrying too much; about how I parent, how I reach my little girls hearts in just the right way for each of their very different personalities; about all the minutae that needs to get done, washing, dishes, dinner, emptying bins, more gardening; about the things I think I place upon myself that I think I have to do (anyone notice … no ‘month of Sundays’ posts recently). 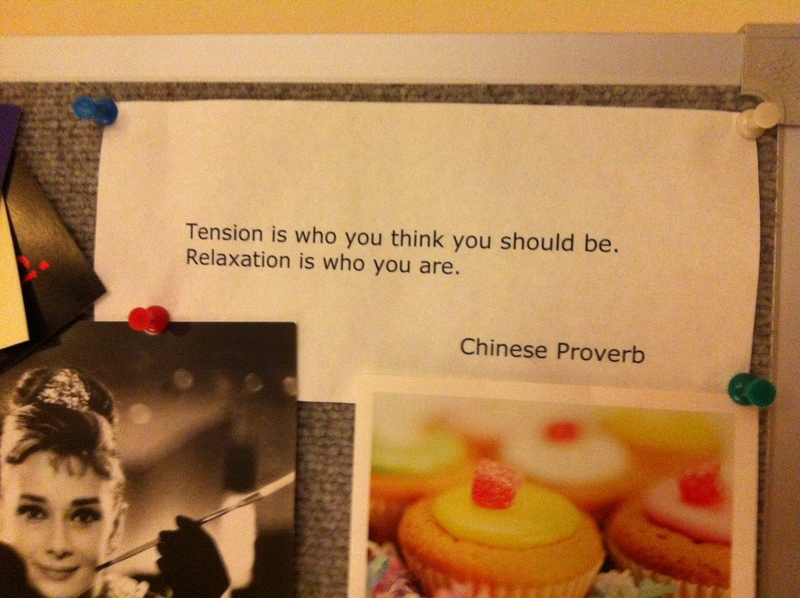 These things, all things I think I should be … tension. What am I? … breathe.